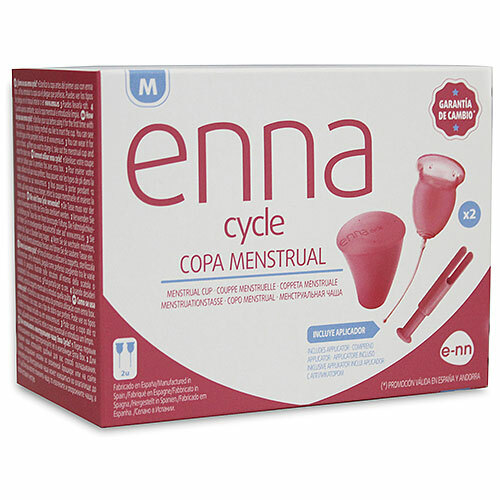 The Enna Cup comes with a handy applicator to aid insertion, once inserted the Enna Cup creates a vacuum with the vaginal walls and can hold up to 12 hours of fluid with no risk of leaks. The medical grade silicone is not only biogedradable but will last for years and ensure your body`s PH is not altered. Please note that the above are recommendations and the perfect fit may be different for everyone. To insert follow the instructions included. It`s recommended that you empty the cup every 4-8 hours. Ensure you wash your hands before and after inserting or cleaning the cup. You can regularly sterilise your Enna Cycle by adding a small amount of water to the storage cup and placing it in the microwave for approximately 1 minute until the water boils. By fitting the lid side on you can safely pour out the excess water once cooled. If you have an IUD consult your Dr, nurse or gynaecologist before using Enna Cup. Below are reviews of Enna Cup Twin Pack With Applicator - Medium by bodykind customers. If you have tried this product we'd love to hear what you think so please leave a review.